I woke up with butterflies in my stomach on brew day. 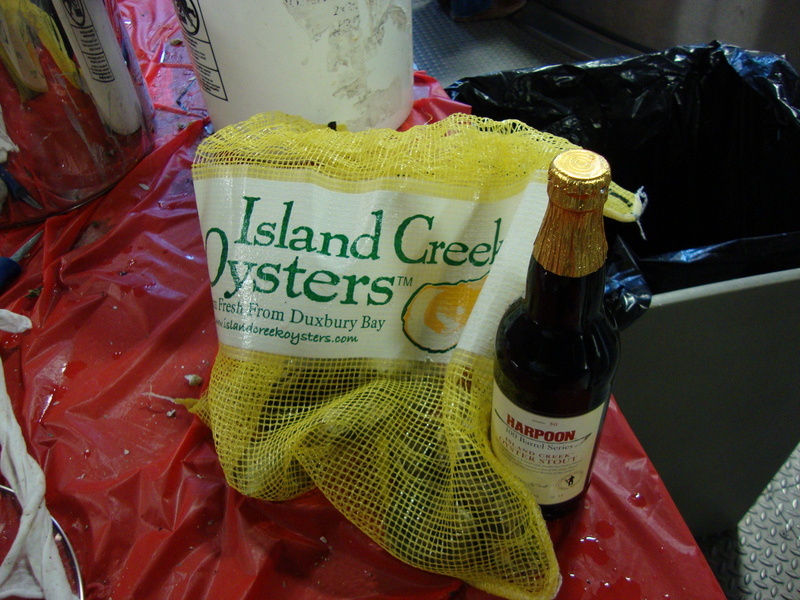 After months of planning, contemplating, and strategizing, we were finally going to Harpoon to shuck oysters for the Island Creek Oyster Stout. After a quick stop at Lucky’s Lounge (we’re planning a stout party there in late February), Shore and I made it over to Harpoon where 6 bags of oysters awaited. Dave Grossman had been at the brewery snapping photos all day and when we got there, a reporter and photographer from the Herald were capturing the event for a piece that ran in the next day’s paper. Not to worry, drinking the beer won’t be like downing an oyster shooter, nor will there be an intense oyster flavor, according to brewer Katie Tame. 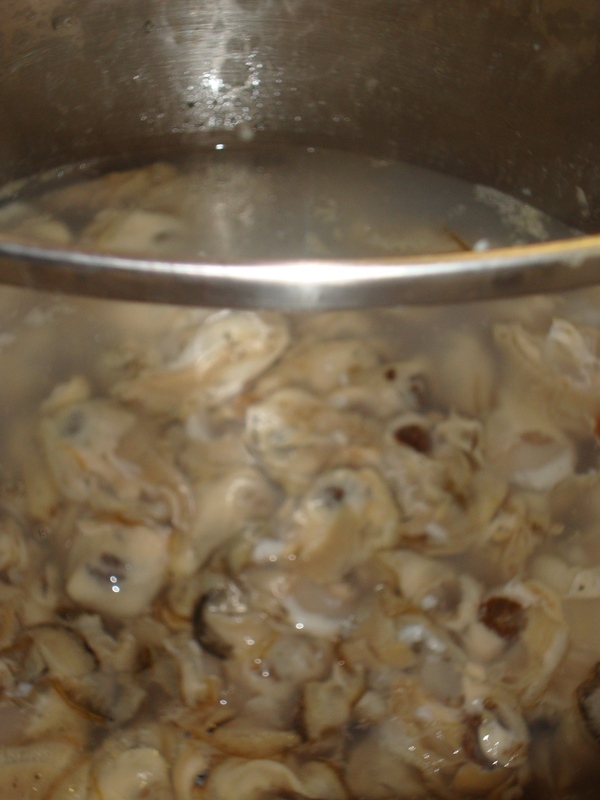 The oysters are poached in the heat of the liquid during the brewing process and disintegrated. “All those proteins boost up the body of the beer, and an increased protein content adds head retention, which is great for the stout,” said Tame, the first female brewer for the 100 Barrel series that started in 2003. “A lot of the oyster quality – be it the brine or actually the oyster itself – will blend with the darker malts,” she said. The expected result is what Tame describes as a full-bodied beer that’ll be a bit sweet, with lots of roasted flavor, “bready, biscuity” flavors from the malt and a little dryness at the finish. Along with Harpooners Bill Leahy and Liz Melby, Katie grabbed a shucking knife and got busy helping Shore and I shuck. We collected the meats into a huge stock pot which Katie dropped into the boil later that afternoon. By the time Skip and his daughter Maya showed up, we were feeling a little like zoo creatures — we’d attracted quite a crowd of onlookers (the tasting room was in full swing by that point) and there were cameras everywhere. But we muscled through and got all 540 oysters opened (180 per batch/3 batches) with a little fortification from a couple pints of Munich Dark and Ginger Wheat – always helpful when shucking bare-handed. So now what? 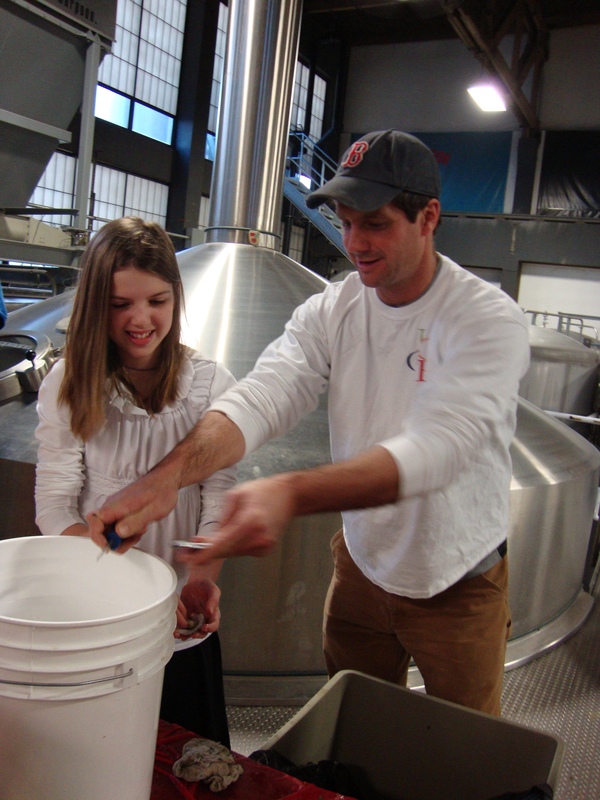 We wait two weeks for the brew to ferment and then we’ll head back to the brewery for Bottling Day on February 5th. Personally, I can’t wait to crack one of these heady brews and taste it alongside a couple of freshly shucked oysters. 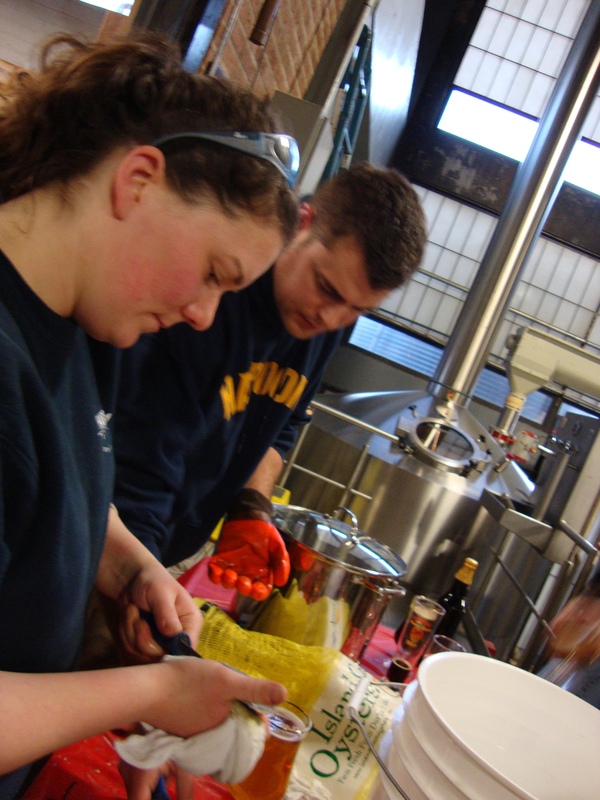 Once it’s bottled, we’re on a whirlwind schedule of tasting events and activities. Part of my fun new office gig is helping the guys plan and put on events and we’ve got a ton planned around the launch of the beer. While I’ve never been that interested in marketing, this is a part of the job I can get into (I think I can add event planner to my resume now). Yes, we’re still harvesting oysters. Despite all this business with beer and parties, the guys are out on the water every day, pulling up our now-dormant oysters. It’s been a weird winter, though. We’re starting to see growth on our seed which is not supposed to happen when the water temps are in the high 20s. 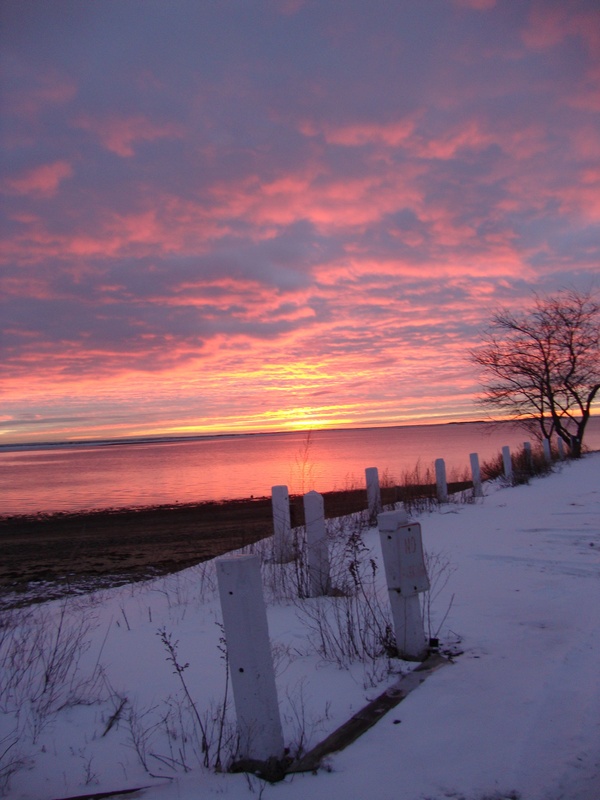 Might be the January thaw? It’s hard to say but we’re keeping an eye on it. The farmers are also putting in orders for new batches of seed. Believe it or not, the cycle starts up again in just a few short months. Both Skip and John Brawley have put in orders and are starting to strategize for the season. Hard to believe we’re talking about upwellers and river trays already. Must mean spring is right around the corner.